← You know what? Let's Wrestle! Vampire Weekend has grown. They might be Vampire Fortnight by now. Their second full-length album, Contra, is still carrying the band’s creative torch just a little over two years after their self-titled debut was released. With their debut, they established themselves as an entirely unique band. Their simple but elegant song structure has this habit of burying itself in the back of our heads. It’s almost magical. Thankfully, the magic hasn’t gone. Contra brings us back to the wonderful world where primary songwriters Ezra Koenig and Rostam Batmanglij’s collective creative subconscious takes physical form. However, something feels different. Mature, even. Yes, the worldly beats are there and the keyboards are dancing around with the bass lines in their usual funky trance but the impression that I get from these songs is one of a band that is evolving. Koenig’s vocals, seemingly sporadic as they may be, ring strongly, deeply, and with the confidence of the kind of person who’s ‘been there’. The playful falsettos on “I Think You’re A Contra” and “White Sky” are unmistakably some of the most powerful parts of this album. Now, the lyrics. Ezra’s clever wordplay and brilliant, ‘how-the-hell?’-type rhyme schemes bring us back to the wonderfully-paranoid end of speculative appreciation. In other words, we sing these words whether we understand them at first or not; surely entranced by the band’s music. However, while the band does write soft, heart-to-heart odes to youth and confusion, they also have the undeniable ability to make you want to have unbelievable amounts of fun. Of course, the perfect example of this at work is the energetic first single, “Cousins”. This song is a strong burst of energetic musicianship. Bassist Chris Baio is picking a mile a minute, drummer Christopher Tomson is relentless on the snare, and both Ezra and Rostam weigh in with quite possibly the catchiest riff they’ve ever written. All in all, the efforts put forth in this album are spectacular. A true work of art, Contra is probably going to be one of the best albums of this year. To paraphrase Neil Armstrong, Vampire Weekend was one small step for man. 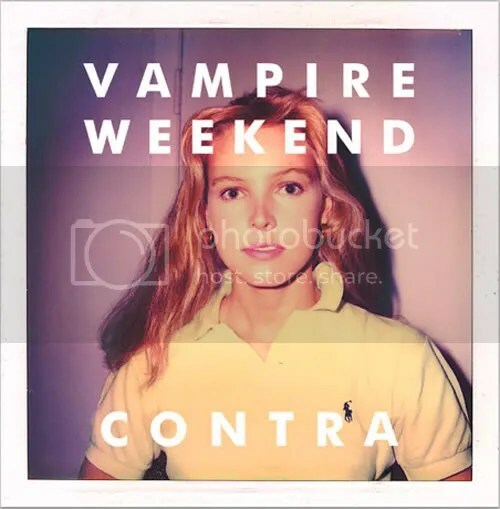 Contra is a much wider step for Vampire Weekend.